Here’s a wonderful opportunity to own a condo in the quiet Stonebridge Estates, close to West Hartford Center and Blue Back Square. This one bedroom, one bathroom ranch-style unit features thoughtful upgrades and an efficient floor plan. Oak hardwood floors and crown molding throughout bring classic elements to the modern living style. A formal entry foyer leads to the heart of the space. The kitchen has granite counters, tiled backsplash, stainless steel appliances, abundant work space and an oversized breakfast bar. It is open to the living room, so relaxing and entertaining is easy. French doors lead to a private patio for outside enjoyment. A spacious master bedroom is tucked down the hall and has generous double closets. A nicely appointed full bathroom offers storage and a separate laundry room. Ten foot ceilings add light and volume throughout. The unit has a deeded covered parking space, plenty of closets, gas heat, central air, and a shared rooftop patio, which is accessed via the building’s elevator. 730 Farmington #102 is offered at $220,000. If you’d like to see this home, please have your agent arrange a showing or call Amy at 860-655-2125 to schedule a visit. More details and a photo tour are available. Steps to all that Downtown has to offer, yet located on a quiet residential street, in a one of a kind building, this two bedroom, one bathroom penthouse unit is a special find! Completely remodeled with hardwood flooring and fresh paint throughout, there is truly nothing to do but move in. The living area is a large open room with cathedral ceilings that is anchored by the exposed brick of the chimney, and the associated wood stove, and lit by a Palladian window and multiple skylights. The space includes the main seating area, a dining area, and an updated kitchen with stone counters and stainless appliances. It is a comfortable room to relax, and a terrific layout for entertaining. The master bedroom, which features two oversized closets, is at the end of a hall that also includes a laundry closet, an updated full bath, and a second bedroom with private balcony with views of the Colt Armory dome. You’ll have your own dedicated garage with auto-door opener, a shared rear deck, secure storage space in the basement, and a lovely front porch and yard to enjoy. The unit features central air conditioning, as well as gas heat and hot water. 33 Charter Oak Place #5 is offered at $255,000. If you’d like to see this home, please have your agent arrange a showing or call Amy at 860-655-2125 to schedule a visit. More details and a photo tour are available. You must see this pristine free standing Ranch condo at Rivertown Village, Windsor’s premier 55+ community. Situated at the end of a cul-de-sac, the home boasts an oversized .31 acre lot which backs to the woods. Enjoy privacy and owning the land, while the homeowner’s association takes care of yard maintenance and snow removal for you. Inside you’ll find lots to love including vaulted ceilings, oak floors, fresh paint, and plenty of closet space. A short walk from the entry foyer you’ll enter the heart of the home, a grand central room where the living room, dining space and kitchen are connected. The kitchen has lots of cabinetry, granite counters, a tile backsplash, and undercabinet lighting. There is a gas fireplace in the living room. Adjacent to this space is a lovely four-season sunroom, a rare find for this floor plan. The master bedroom is spacious with a walk-in closet featuring built-in drawers and shelving. The en-suite bathroom is updated with granite-topped cabinetry and a unique vessel sink. A second bedroom is nicely sized. It’s adjacent to a second full bathroom, which also services the living space. Laundry is tucked away on the main level in a large closet. The basement is perfect for finishing or for storage. The unit has an open front porch, as well as a large rear deck, perfect for entertaining. 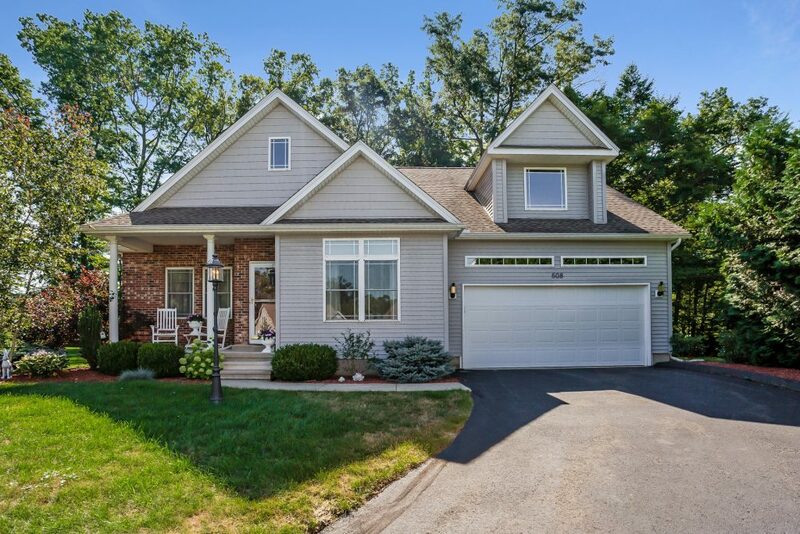 An attached 2-car garage, central A/C, low monthly fees ($235), a community clubhouse, and close proximity to I-91 add to the appeal of this fantastic home. 608 Inlet Lane is 2 bedrooms, 2 bathroom, 1,576 sqft, and is available for $289,000. For more information, or to schedule a private tour, please contact Amy Bergquist at 860-655-2125 or AmyB@AmyB-RE.com. More details and a photo tour are available. 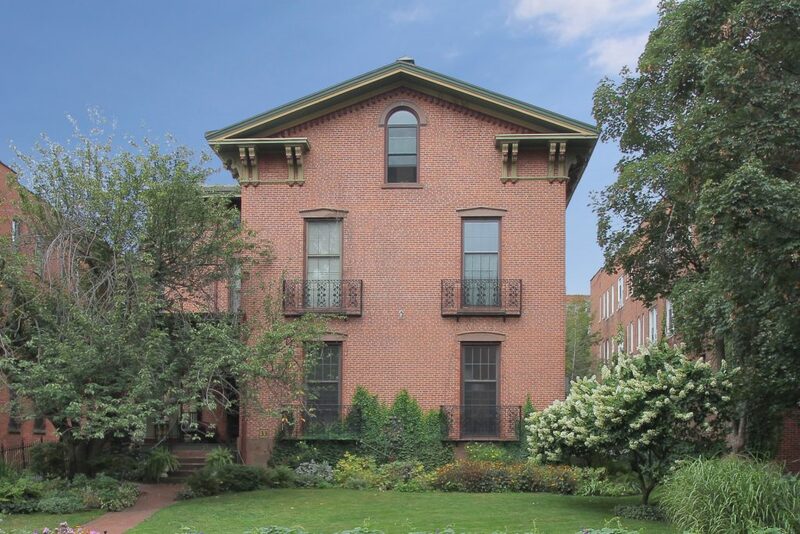 It is rare to find a truly exceptional home in Downtown Hartford, but 33 Charter Oak Place has a very unique opportunity available – a four-bedroom penthouse condominium. Charter Oak Place, the original site of the Charter Oak tree that was used to hide the Connecticut State Charter in 1662, is a quiet residential street one block south of the Public Library in Downtown Hartford. Number 33 is on the north end of the street, and is one of the many 19th century buildings that define the neighborhood. Built in 1860 for Nathaniel Shipman, an attorney and federal judge, the Italian Villa style Victorian home features large windows, high ceilings, preserved architectural details, and an offset veranda at the entrance on the left side. The interior of the building was reimagined and updated in the 1980s. There are currently 5 units, organized around the original central staircase. The most spectacular residence is on the top level. 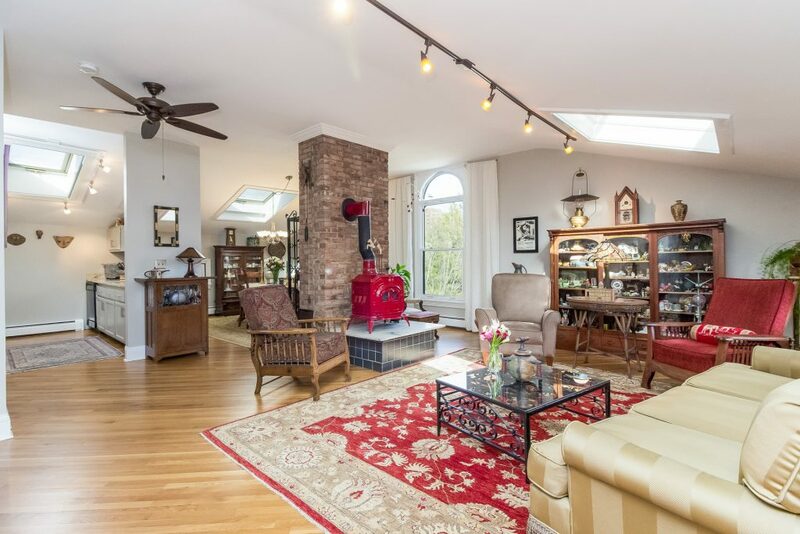 The main living area includes the open living room, dining area, and kitchen, which are all accented by an exposed brick chimney with wood burning stove. A tall Palladian window stretches all the way to the vaulted ceiling, looking east over the other historic buildings on the street. Numerous skylights ensure that the oversized space is bright and cheery, in addition to being fully updated and freshly painted. There are four bedrooms and two full baths on the top level of the building. By combining unit 5 with unit 3, the current owners created a spacious and functional space that provides modern amenities, historic character, central location, and a feeling of home. Everything has been updated, with modern finishes in the kitchen and baths. There is laundry in the unit near the master bedroom, and the entire space is air conditioned. The combined unit even comes with two garage parking spots. The building itself is a beautiful example of Victorian architecture. Exterior details welcome guests, and embrace you on the private covered balcony with views of the Colt Armory dome. Touches throughout the building and unit are a constant reminder that 33 Charter Oak Place is part of the City’s history. Everything within the Downtown area is within walking distance. The Library and Front Street district are just a block away. Colt Park is about a block away in the other direction. It’s a short walk to the Wadsworth, the central business district, Bushnell Park, and all the restaurants, theaters, and entertainment options the City has to offer. On those chilly days when you’re not up for a walk, the free Dash shuttle provides an additional option to move throughout Downtown. Despite those advantages, what really makes this property special is that it feels like home. A large fenced front lawn is available for your enjoyment. Chairs line the front veranda, encouraging a conversation with your neighbors. The penthouse residence offers a unique space that can be enjoyed as a quiet refuge in the heart of the City or shared with friends as a central gathering point. This is Downtown living at its best! 33 Charter Oak Place, Unit 3-5, is 4 bedrooms, 2 bathrooms, and 2,313 sqft, and is available for $495,000. For more information about this amazing space, or to schedule a private tour, please contact Amy Bergquist at 860-655-2125 or AmyB@AmyB-RE.com. Both units will be open to the public on Saturday, May 5, 2018 from 12:00 to 2:00. Stop by to see them in person! Steps to all that Downtown has to offer, yet located on a quiet residential street, in a one of a kind building, this two bedroom, one bathroom penthouse unit is a special find! Completely remodeled with hardwood flooring and fresh paint throughout, there is truly nothing to do but move in. The living area is a large open room with cathedral ceilings that is anchored by the exposed brick of the chimney, and the associated wood stove, and lit by a Palladian window and multiple skylights. The space includes the main seating area, a dining area, and an updated kitchen with stone counters and stainless appliances. It is a comfortable room to relax, and a terrific layout for entertaining. 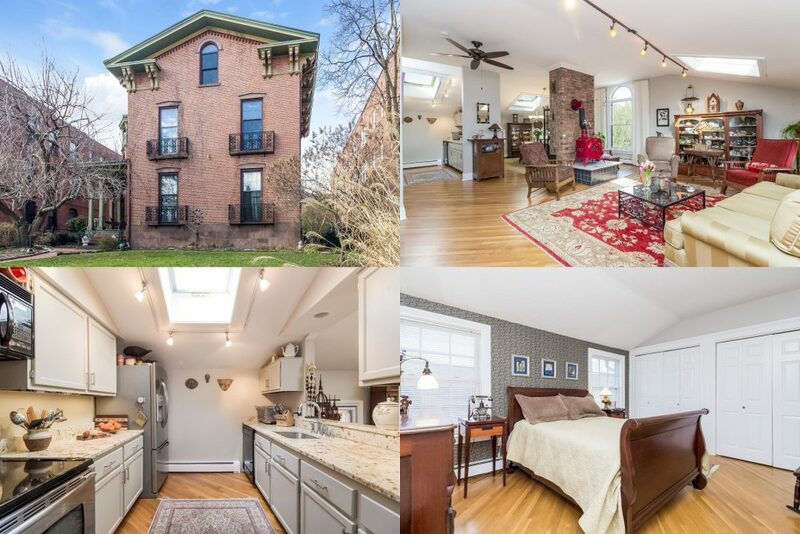 The master bedroom, which features two oversized closets, is at the end of a hall that also includes laundry, an updated full bath, and a second bedroom with private balcony with views of the Colt Armory dome. You’ll have your own dedicated garage with auto-door opener, a shared rear deck, secure storage space in the basement, and a lovely front porch and yard to enjoy. The unit features central air conditioning, gas heat, and a new gas hot water heater. 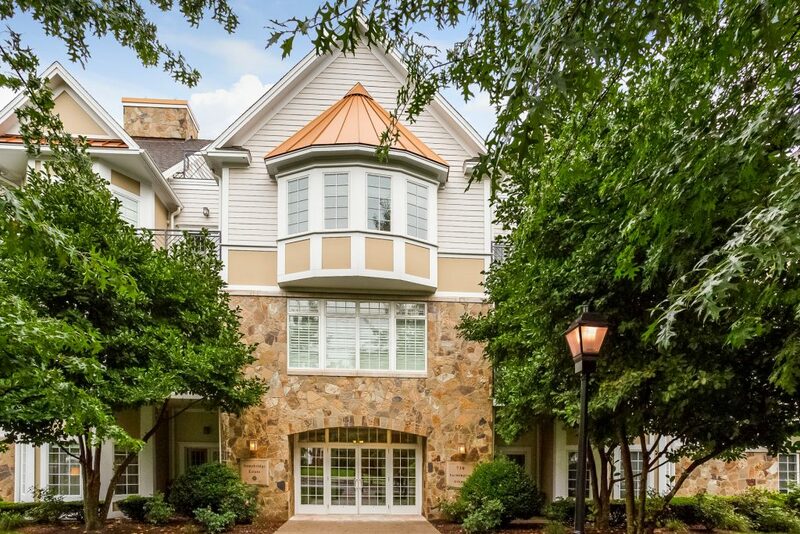 33 Charter Oak Place, Unit #5 is offered at $265,000. If you’d like to see this home, please have your agent arrange a showing or call Amy at 860-655-2125 to schedule a visit. More details and a photo tour are available.